When there’s talk of a V6 engine, our minds usually default to cars—there’s a number of flat sixes in the world of two wheels, but a proper V6 sounds more like a discussion about an older Mustang or a Charger. However, a few, more underground companies have managed to fit a six in the tiny frame of a motorcycle. 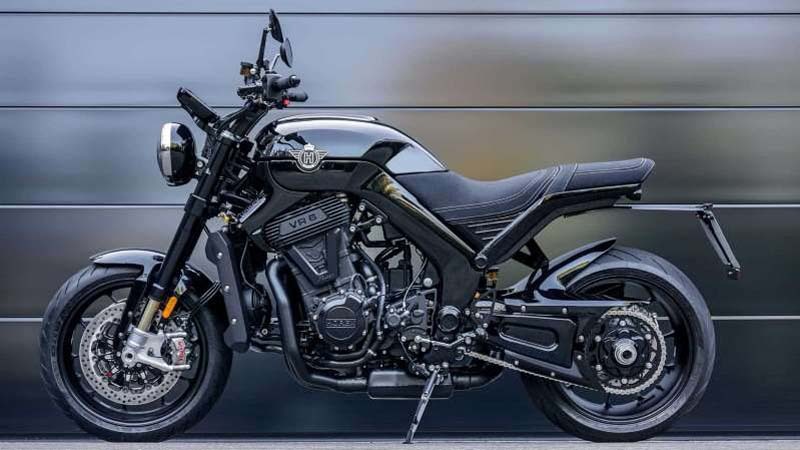 It’s the case of German manufacturer Horex that offers a full line-up of 6-powered bikes. It now added a new one: the VR6 Raw and it’s a beast. Horex already has a fleet of VR6 variations, all powered by the same 1,128cc, V6 engine producing 161 horsepower and 94 lb-ft of torque. The company’s V6 is particular in that the inclination angle between the cylinders is so tight—only 15 degrees—that all the cylinders fit in the same set of barrels for a total lenght of only 17 inches, which makes it easier to fit within the frame of a motorcycle. Horex now introduced a new model to the lineup; the Raw, a black-on-black behemoth with a microfiber seat and matte aluminum y-spoke wheels. This heavyweight tips the balance at 485 lb and its got a stature to match. The VR6 Raw is imposing. Its silhouette remains the same as the other versions of the VR6, but receives a flight of matte black components to fit its shadow style, including the double exhaust tips, mirrors, and handelbar. Towering over the single round headlight marked with the company’s “H” insignia, a massive, tablet-like 7-inch color display serves as a tool cluster. With all this power, the VR6 needs braking power to match, provided by a set of Brembo M50 calipers, as well as Öhlins suspension. The rest of the VR6 lineup also receives a few upgrades for 2019, including the sharp 7-inch screen. Sadly, we don’t get to see these Amazons in North America, but thankfully, others who had the chance to get their hands on one were generous enough to share the music. What a sweet, sweet sound.